The family never imagined they'd see their dog again. Rick and Michelle Riendeau couldn't believe their eyes when they saw their beloved dog Lady earlier this week. 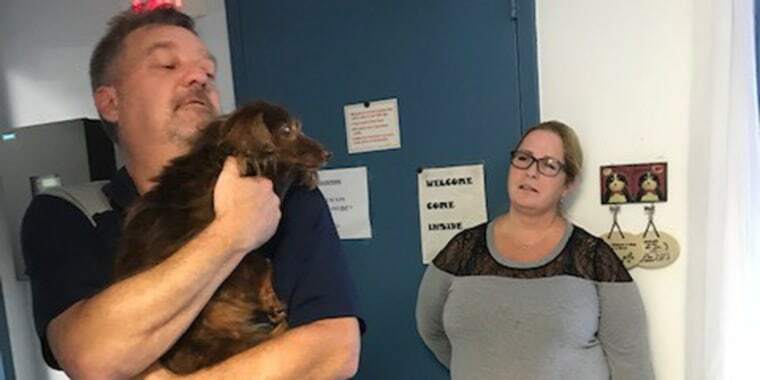 It was the first time they had seen her in the more than five years since the 17-year-old dachshund had gone missing from their Brooklyn, Connecticut, home. Animal control officer Donna Gremminger found Lady wandering in a parking lot in Mohegan Park in Norwich, Connecticut, last Thursday. A scan of Lady's microchip turned up a phone number for Rick's former employer. "When that person called me from that company and said, 'Are you missing a dog?' my response was, 'I am not missing a dog,'" Rick told TODAY. "It’s been five years." When, despite his doubts, Rick called animal control in the area, he wasn't prepared for what they had to say. "When I called and they said this dog is a redheaded, long-haired dachshund, my heart dropped," he said. "I ran upstairs, I said (to my wife), 'We’ve got someplace to go. Lady’s alive.'" Rick and Michelle rushed over to the pound to greet Lady. "My wife was driving the speed limit, I wanted her to do twice the speed limit," Rick said. "It felt like an eternity. I was a mess." Chris Lamb, founder and president of animal rescue nonprofit CT Animal House, was prepared to take in Lady, who is partly deaf and blind, as a medical foster before they were able to trace her back to her owners. "I was pretty blown away," Lamb said of Lady's homecoming. "Donna and I both got teary because this does not happen very often. This is the stuff that keeps you going." The Riendeaus got Lady on a family trip to Arizona in 2001, when Michelle's sister-in-law said there was a "jewel" at the pet store where she worked that they simply had to see. When Lady went missing a few years ago in the wooded area near their house, Rick feared she had fallen prey to coyotes or that, at her advanced age of 12 years old, she had left the home to die. "I prepared myself for the worst," he said. So far, Lady seems happy to be back home and is ready to resume her role as top dog in the house. The family also has a 9-year-old golden retriever, Jake. "She laid down the law that this is her house; he was going to follow her rules," Rick said of the dogs' first months living together. "Even though she was probably 15 pounds and he was 124 pounds, there was no question who was the boss." In Rick's eyes, Lady doesn't have to prove a thing. "Far and away she’s been the most lovable, loyal pet that I’ve ever had," he said.